Cisco's 2018 Global Cloud Index report identifies IoT devices as a major new source of cloud data and predicts a shift toward hyperscale cloud data centers. Growing IoT data needs and a shift toward hyperscale data centers are among the newest major trends in cloud computing. 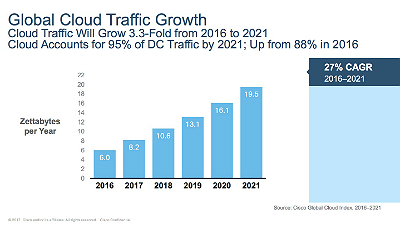 That's according to Cisco's latest Global Cloud Index report, released Monday. The report, which represents the seventh annual study of its kind, seeks to identify trends that will shape the future of cloud computing through 2021. It reflects research on consumer-focused cloud services, such as streaming video, as well as cloud analytics, data storage and other enterprise use cases. Among the report's major projections is the steady growth in the amount of data stored in the cloud. Cisco predicts that the total size of data stored in data centers will increase from 286 exabytes in 2016 to 1.3 zettabytes in 2021. For those of you who don't want to do the unit conversions and the math, that's a five-fold increase in data size. A zettabyte is equal to 1 trillion gigabytes. That cloud data will continue to increase in size is perhaps not surprising; no one was expecting cloud data storage needs to shrink. What is notable, however, is that data collected by IoT devices will account for much of the growth, according to Cisco. The report doesn't make a specific prediction about how much data IoT devices will generate in coming years, but it says that they will be "largely" responsible for the growth of data overall. Cisco isn't alone in seeing IoT data management as an important challenge to solve in coming years. To cite another example, Peter Hortensius, Lenovo CTO and chief of strategy, says that the "data challenge is immense" in regard to IoT and promises that his company is working on solutions. Also worth remarking is the report's prediction that "the amount of data stored on devices will be 4.5 times higher than data stored in data centers" by 2021. This finding is a reminder that, although the cloud might be a popular place for storing data, device storage is important too. Don't underestimate the storage potential of all of the connected devices out there, which will number something like 20 billion by 2020. Another of the report's interesting findings is that "hyperscale" data centers are overtaking traditional data centers as the basis for cloud infrastructure. A hyperscale data center is one with massive amounts of computing resources, enabling a virtually unlimited amount of scalability for the applications and services that it hosts. Cisco predicts that more than half of all data-center servers will run in hyperscale environments by 2021, compared with about one-quarter today. This is good news for infrastructure providers based in the United States, where the vast majority of hyperscale data centers are located. On the other hand, the undersupply of hyperscale infrastructure in other regions might create challenges as demands for data sovereignty increase following the implementation of regulations like the GDPR. Cisco believes that SaaS will not only remain healthy, but will continue to grow over the next several years. By 2021, the report says, SaaS workloads will account for 75 percent of all cloud workloads, compared to 71 percent today. Interestingly, Cisco also thinks PaaS will grow from 8 percent of cloud workloads today to 9 percent by 2021. That's only a slight increase, but it's notable because it suggests that predictions of PaaS's imminent death – which have become a recurring trend over the past few years – will continue to be wrong for the foreseeable future.